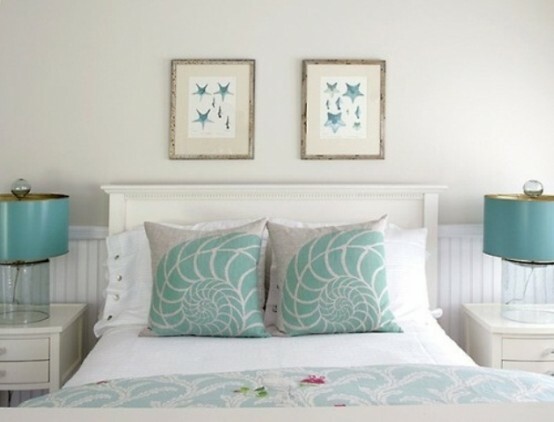 Sea-themed wall art and white sea shells that are covering a bedside table complete light blue wall color to make an interesting impression. 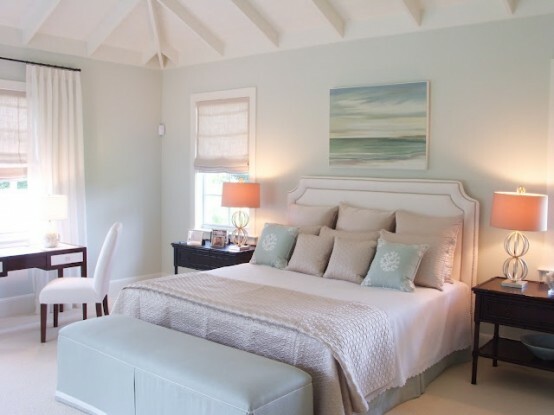 Beach, holidays and lots of sunlight and soft breeze – that’s what we all dream about! 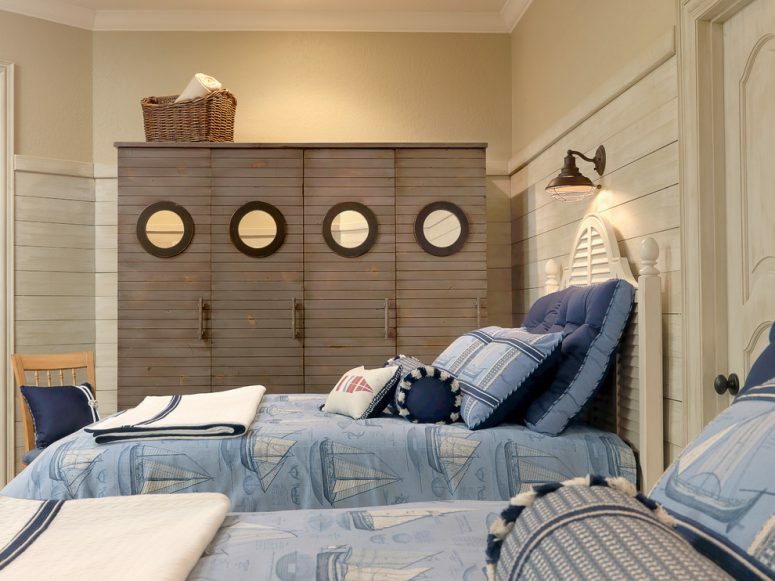 To save your holiday impressions you may decorate one of the rooms with beach or sea details and accessories. 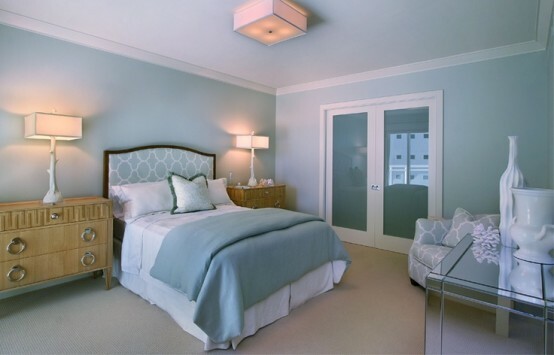 Dark blue, turquoise, color of sand and white splashes are a great color scheme, very relaxing and calm. 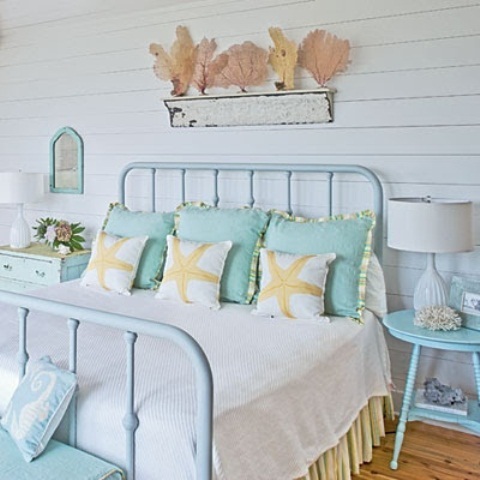 Add sea shells, starfish and urchins, sea-inspired candleholders and pictures and voila, your delicate beach-inspired space is ready! 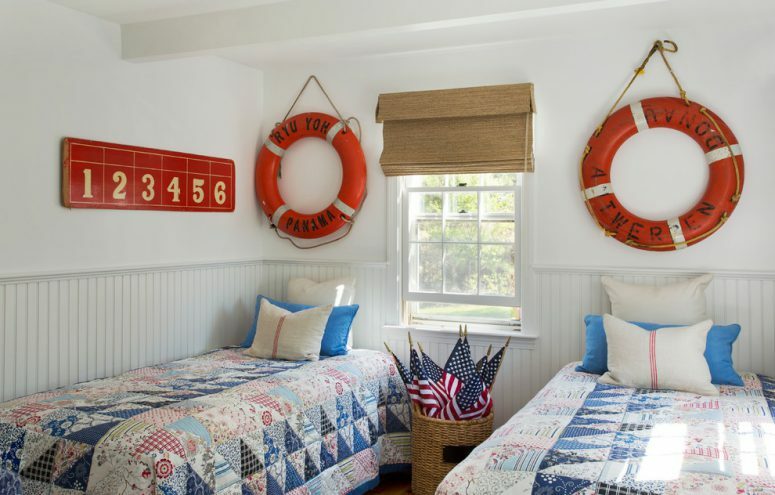 Vintage suitcases and baskets for storage are ideal to highlight the theme. 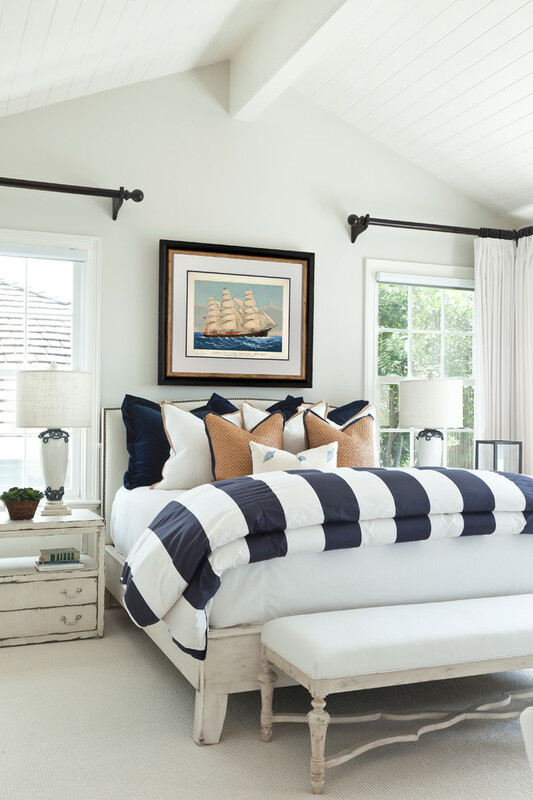 Some unexpected details like an oar or a boat model would be a perfect accent. 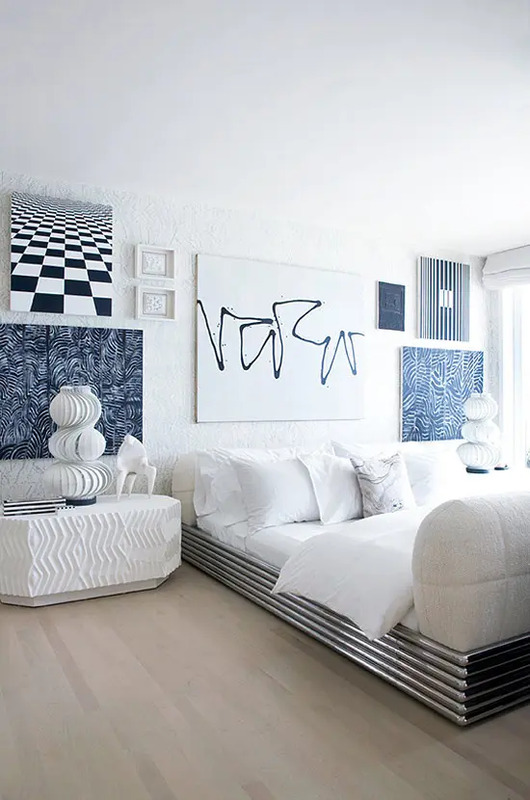 Enjoy brilliant designs below and get inspired! 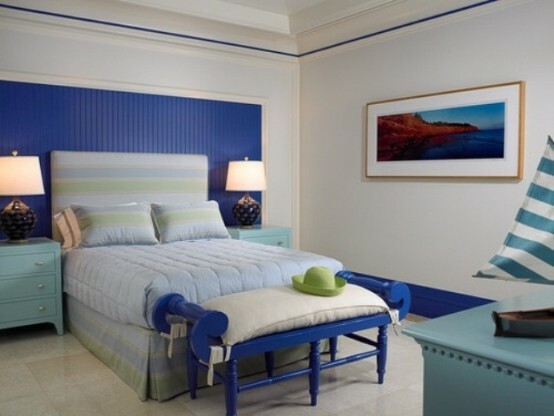 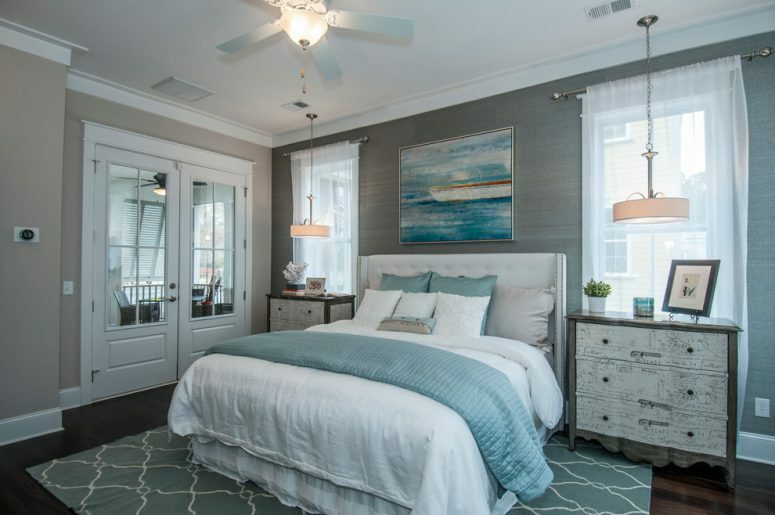 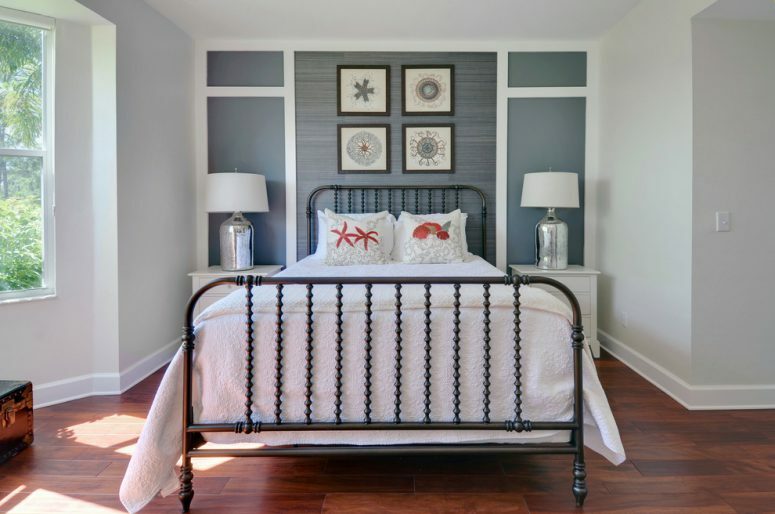 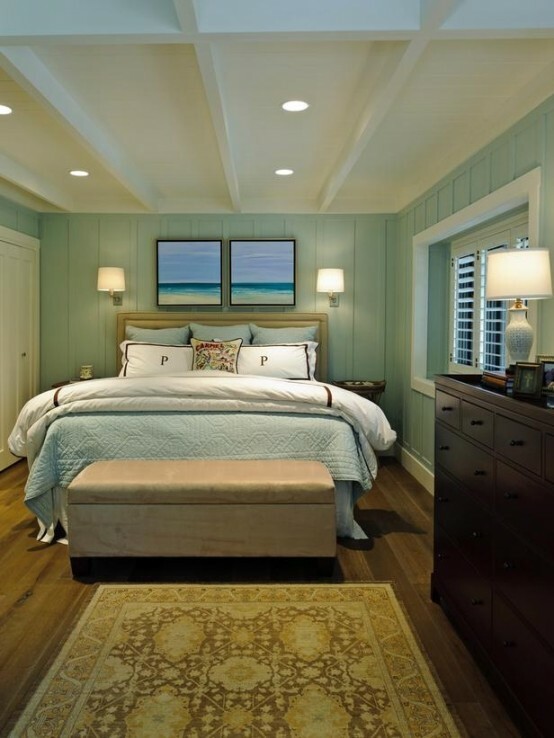 Non standard blue shade used in this bedroom reminds a color of water in Mediterranean sea. 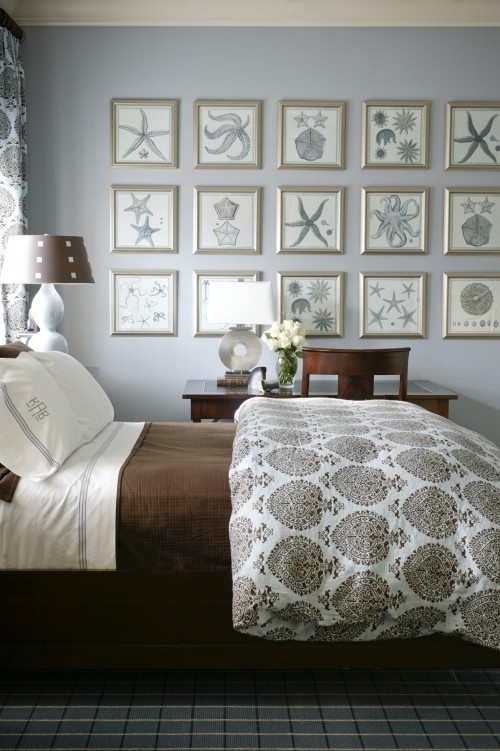 A little gallery art wall showing some beautiful sea creatures to continue the theme. 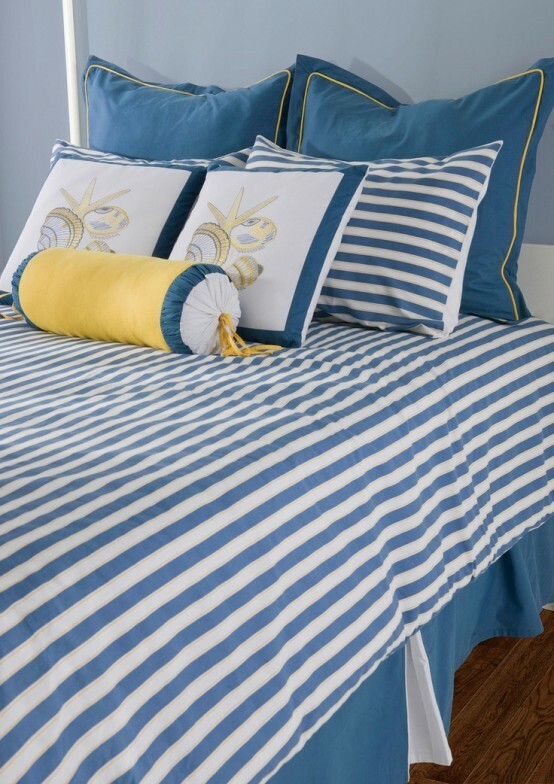 Sea themed beddings sets are available nowadays from many manufacturers. 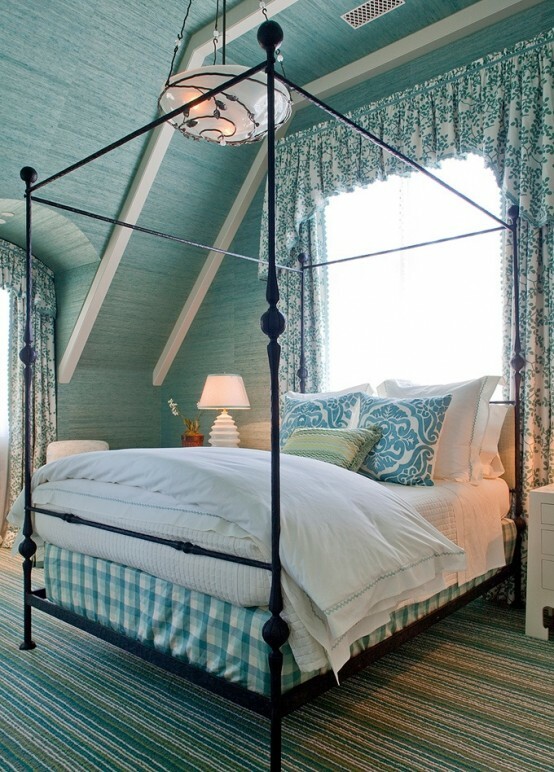 This shade of blue is probably the most popular coastal paint color. 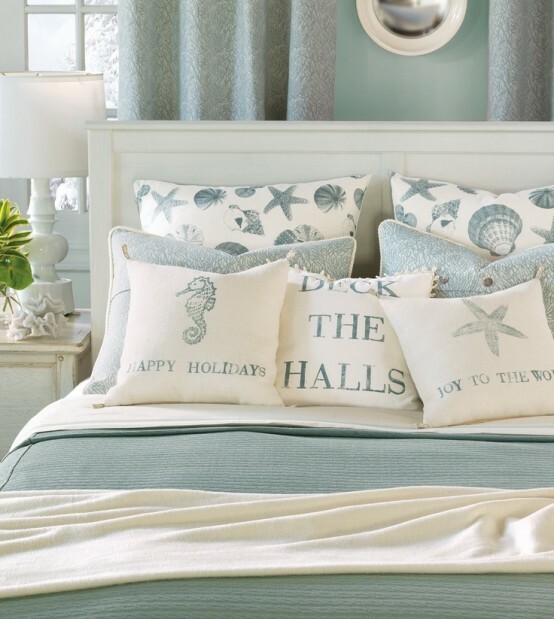 Seashells pattern is perfect for pillows. 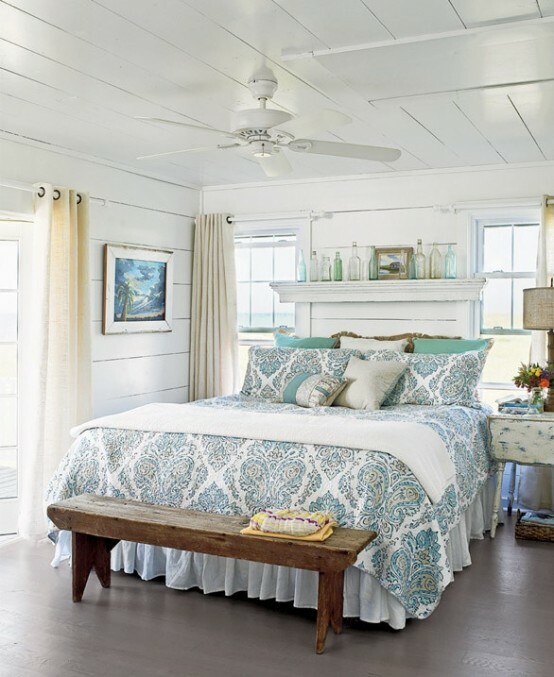 Weathered furniture is perfect for beach themed bedrooms. 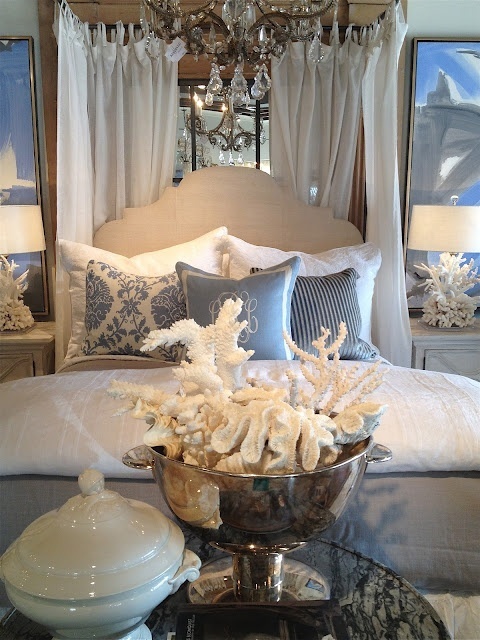 Of course adding sea stars works too. 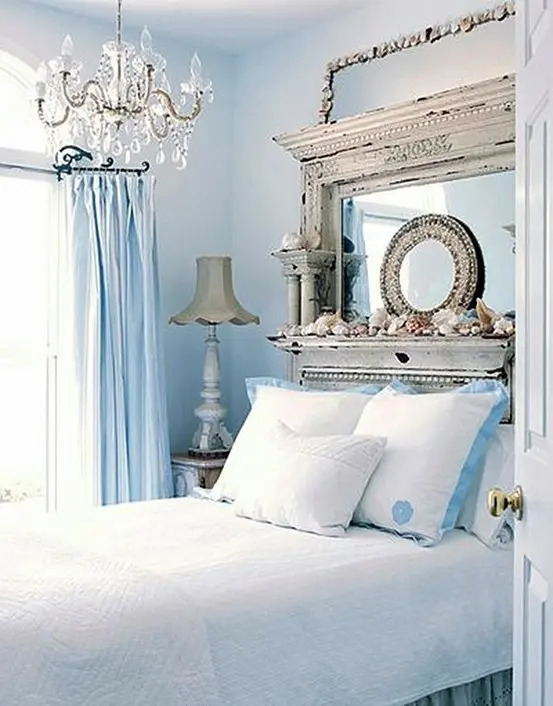 Even without any special decor, light blue combined with beige could remind you about all that relaxing time you had on holidays. 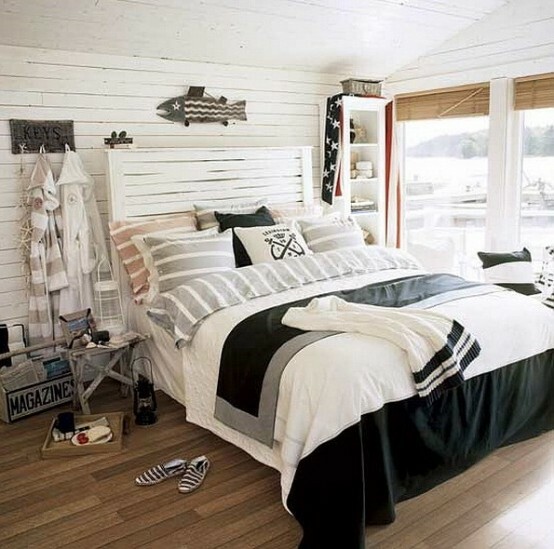 Whitewashed wood wall would be a great accent in a sea themed interior. 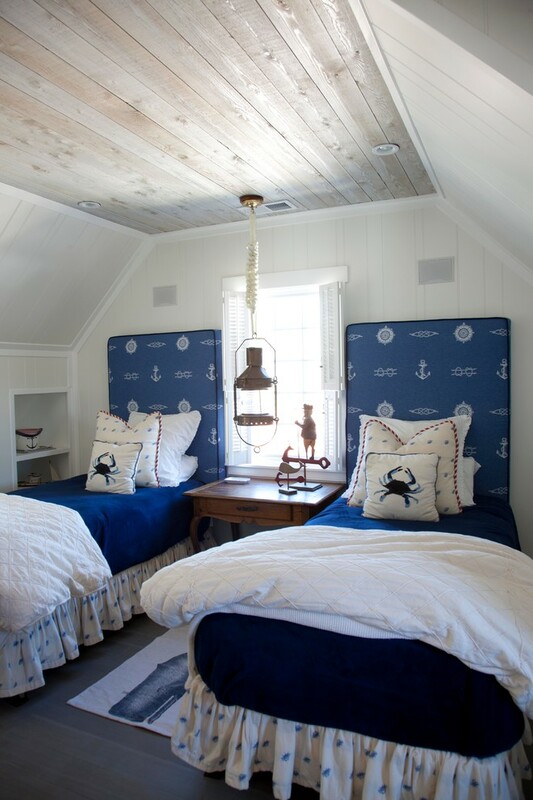 A nautical bedding set is one of those things that could help to add a sea vibe to any bedroom design. 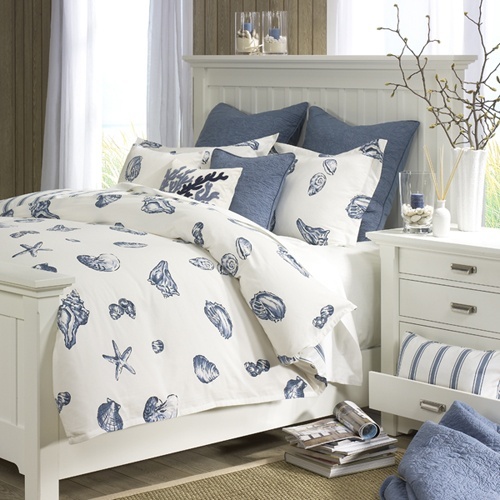 Sea shells and sea stars is a perfect pattern for a bedding set. 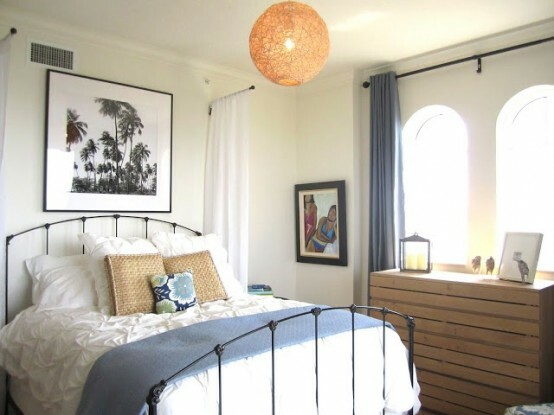 Simple yet cool wall decor isn't hard to make. 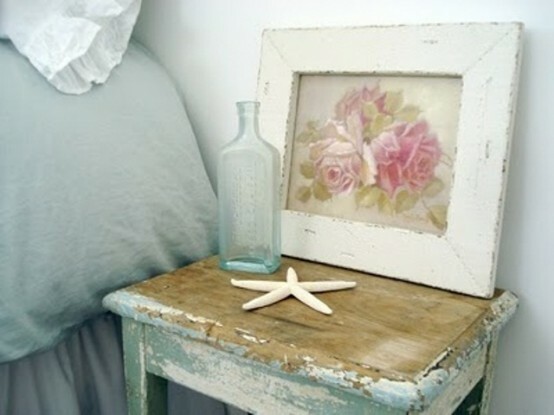 A weathered wood shelf with sea weeds cut from paper would work as a charm. 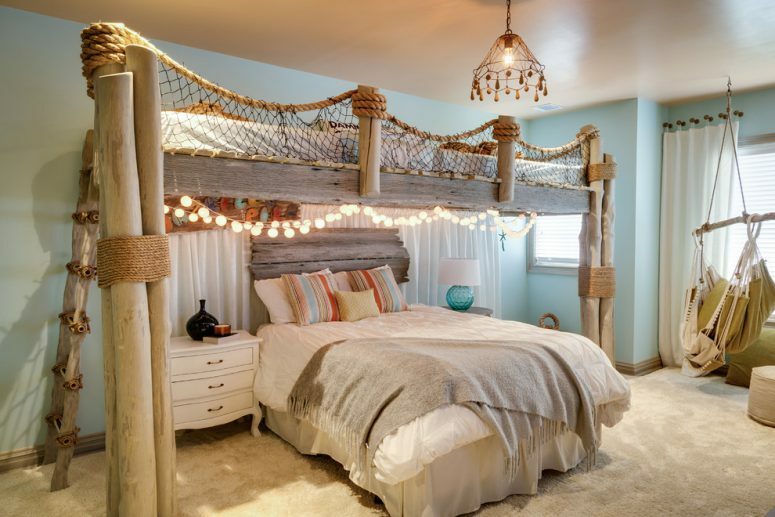 Burlap and natural wood works great for the theme. 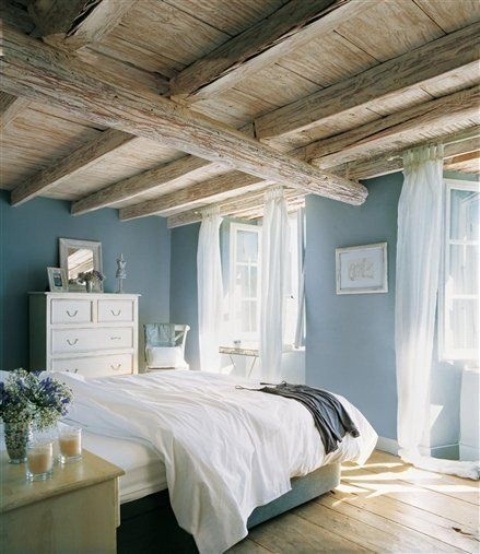 If you wish to go bold then hang a bout in your bedroom. 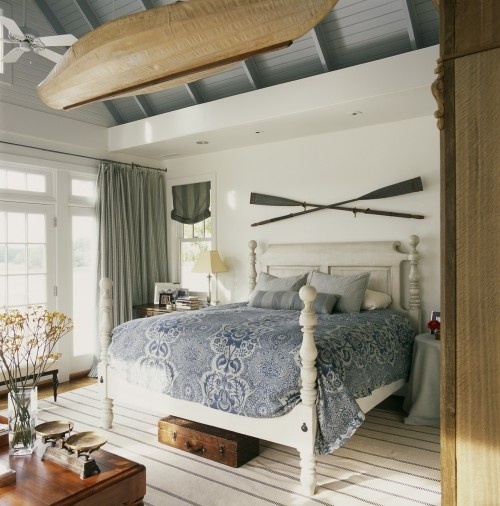 Traditional wooden oars are also a great addition. 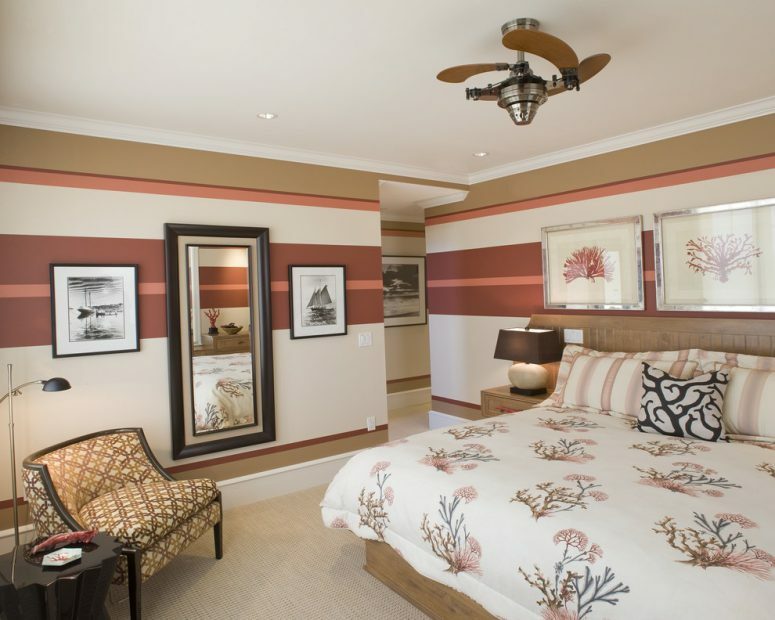 Pictures of palms on walls work as well. 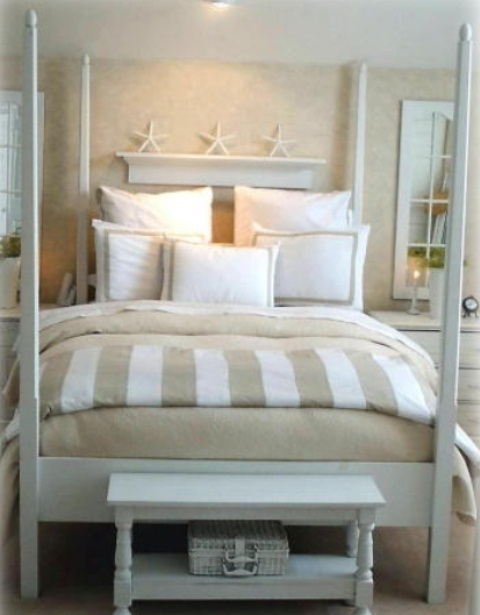 If you don't have a headboard or it's quite small you can put a display shelf above the bed. 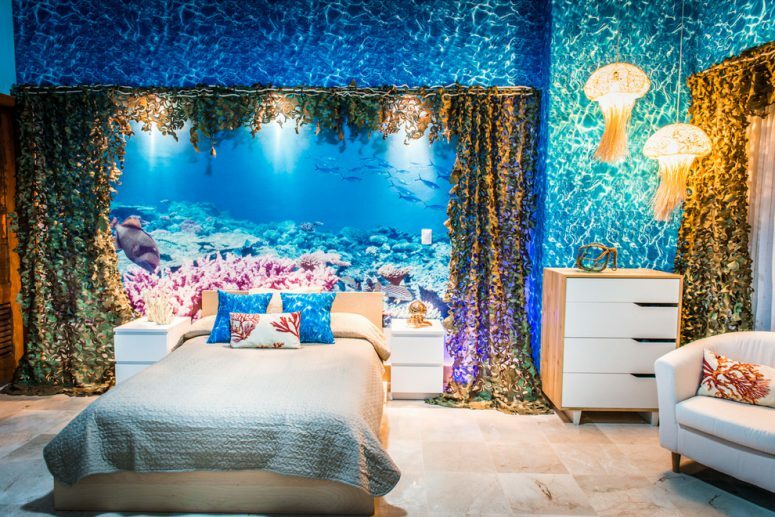 Sea stars would look great there. 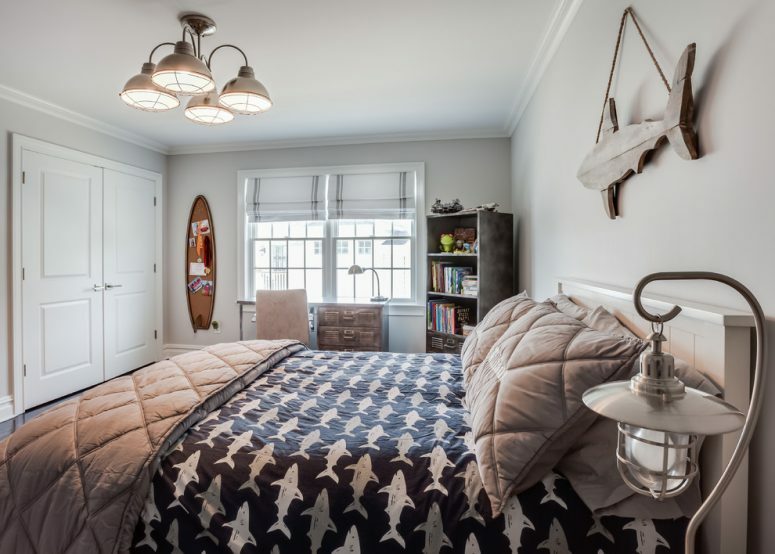 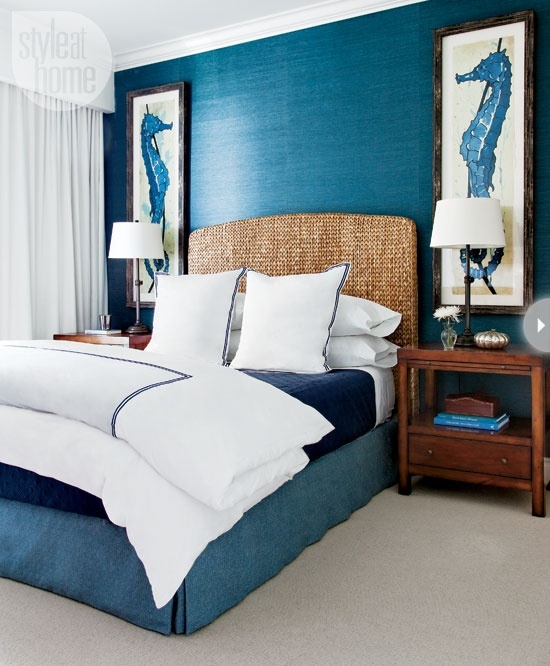 Awesome shade of blue is combined with oversized pictures of sea horses in this gorgeous bedroom design. 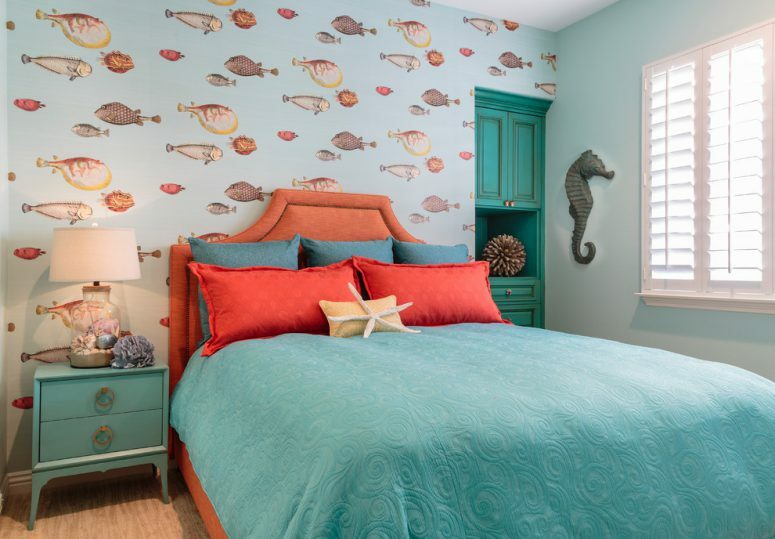 The great example of a sea-inspired art wall. 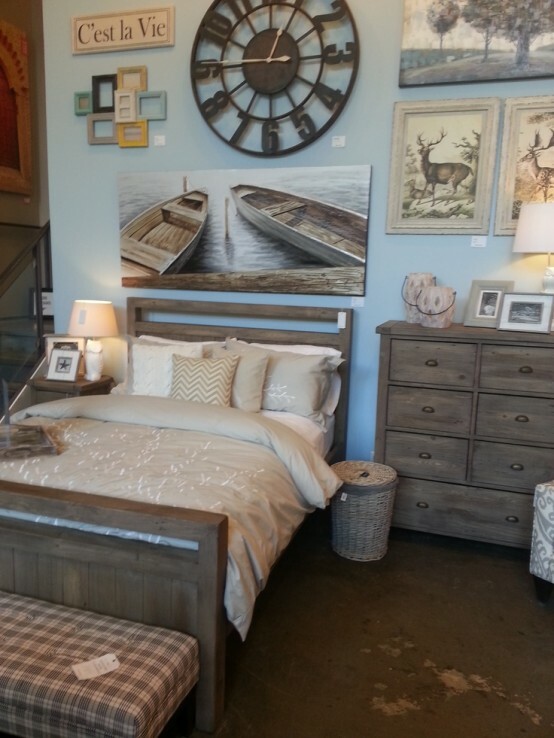 With only a headboard you can set a tone for the whole bedroom. 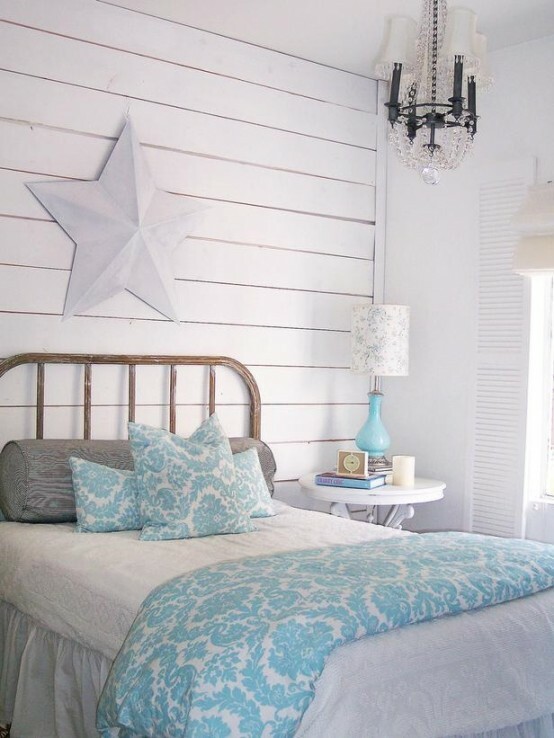 Here is a really unique example of such headboard. 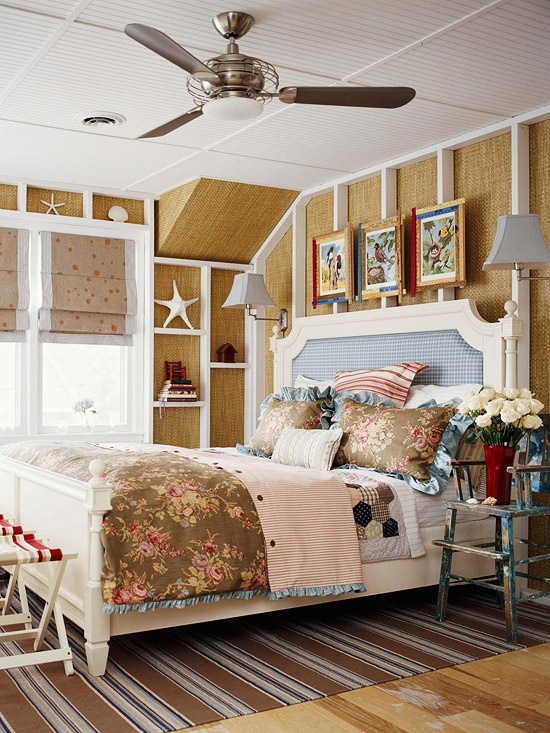 Natural fiber woven rugs is one thing but walls decorated in this way is something much more intreating and cool. 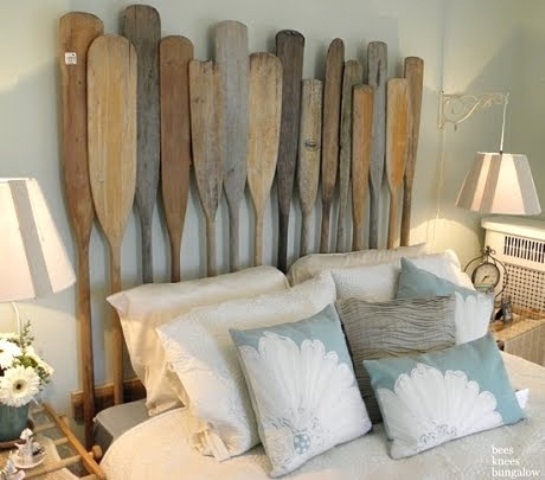 DIY headbaord made of used wooden oars is a nice repurposing project that fit the theme nicely. 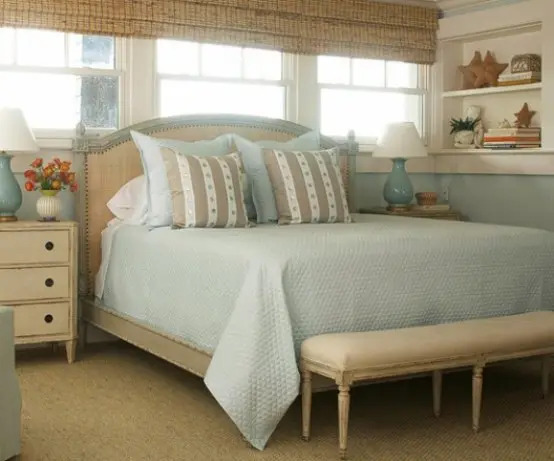 An attic bedroom could easily be beach themed and popular for that shades of blue would work there without any problems.